Papyrus codex containing the Nativity of Mary (“Protevangelium of James,” P.Bodmer 5), the Correspondence of Paul and the Corinthians (“3 Corinthians,” P.Bodmer 10), the 11th Ode of Solomon (P.Bodmer 11), Jude (P.Bodmer 7), the paschal sermon of Melito (P.Bodmer 13), a hymn (P.Bodmer 12), and 1-2 Peter (P.Bodmer 8). 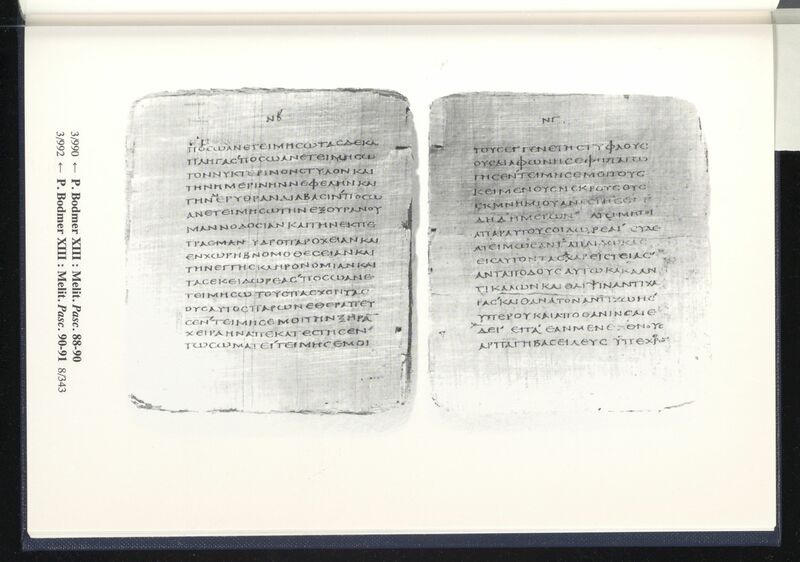 Description: The Bodmer “Composite” or “Miscellaneous” codex consists of a series of papyrus quires containing a diverse range of literature copied by at least three different copyists. P.Bodmer 8 (1-2 Peter) seems to have been part of a different codex before being joined to the unit consisting of P.Bodmer 5+10+11+7+13+12. Most of P.Bodmer 5 and 13 are conserved as an intact book block. The remaining folios have been conserved between glass plates. The latter are illustrated here with color images, while the leaves still in the book blocks are illustrated with black and white photographic plates first published in 2000. The various parts of the codex consisting of P.Bodmer 5+10+11+7+13+12 seem to have arrived at the Bibliothèque Bodmer as multiple different purchases in 1956 (Robinson, The Story of the Bodmer Papyri, 40-46). P.Bodmer 8 was later deacquisitioned in 1969. These leaves were given as a gift to Pope Paul VI and now are part of the Vatican Library. CopistesSeveral different copyists have been identified in the codex. Hand A copied folio 1r-25r (P.Bodmer 5), Hand B copied folio 25v – 34r (P.Bodmer 10+11+7), Hand C, a neat capital that gives the impression of a biblical majuscule without having some of the characteristic features of that style, copied folio 34v – 67v (P.Bodmer 13+12). It also appears that Hand B copied P.Bodmer 8 (see Wasserman, “Papyrus 72”). At several points, the original text has been overwritten by a different hand. The page width varies between 14.2 to 14.6 cm. The height of the page varies between 14.6 to 16.0 cm. The ratio of page (width/height) is 0.913 to 0.973. For Hand A, the width of written area is 9.6 cm, the height of the written area is 10.9 cm, and there are 16 lines per page. For Hand B, the width of written area is 12.0 cm, the height of the written area is 14.0 cm, and there are 17 lines per page. For Hand C, the width of written area is 10.3 cm, the height of written area is 10.6 cm, and there are 17 lines per page. There are currently 85 extant folia. Quires: In its latest phase, the codex seems to have consisted of 13 quires. These can be divided into two distinct units. The first, P.Bodmer 5+10+11+7+13+12, consisted of 9 quires, all but two of which are made of up of 4 sheets (the first and fourth quires are composed of 3 sheets each; the make-up of the fifth quire is not completely certain, but a quaternion is most likely). Facing pages in these quires are not aligned, horizontal fibers (→) precede vertical fibers (↓) in the first half of each quire, and vertical precede horizontal in the second half of each quire. The second unit, P.Bodmer 8, originally occupied 2 quires of four sheets and the first three folia of a third quire. Facing pages in these quires are not aligned, horizontal fibers (→) precede vertical fibers (↓) in the first half of each quire, and vertical precede horizontal in the second half of each quire. 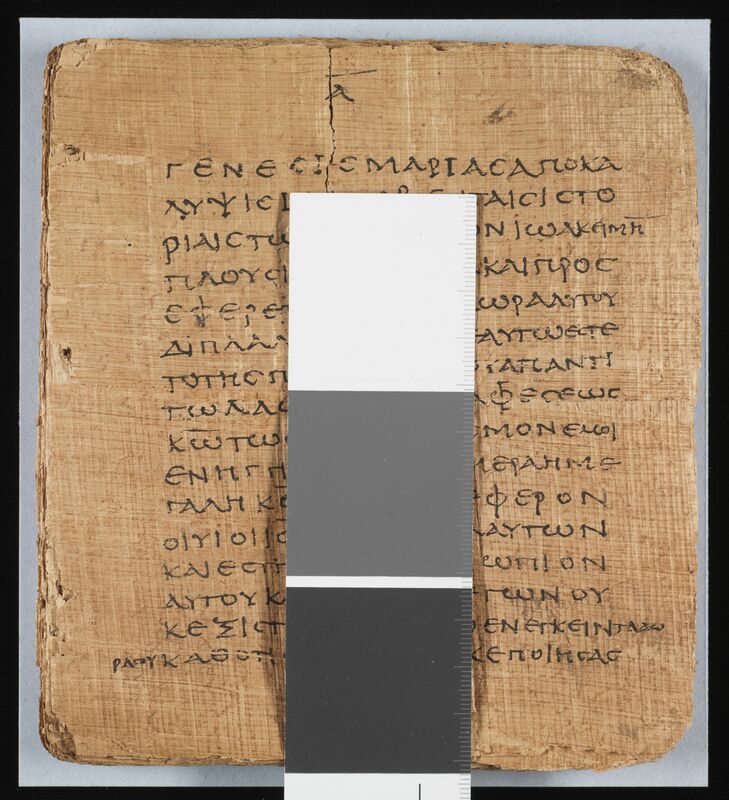 At some point, the remaining leaves of the third quire were removed, folio 1 and folio 2 were joined artificially by a papyrus patch along the fold. Folio 3 and folio 4 were joined in a similar fashion, and the resulting 4 quires of P.Bodmer 8 were joined to the 9 quires of P.Bodmer 5+10+11+7+13+12 (see Nongbri, “Recent Progress” for details). Testuz argued that the booklet containing P.Bodmer 20+9 (the Apology of Phileas and Psalms 33-34) also belonged to this codex. The leaves are roughly the same size, but there is no clear codicological connection linking this booklet to the codex. 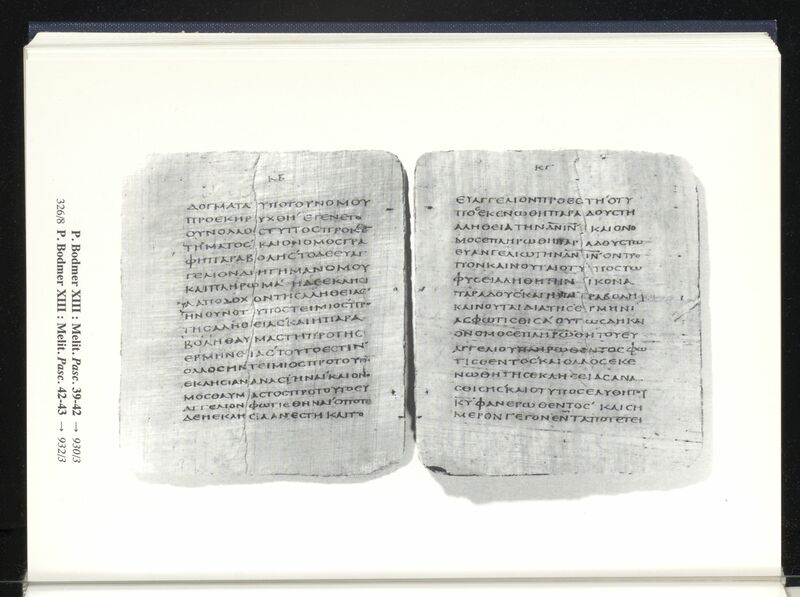 Binding: The codex shows evidence of two distinct bindings. The quires have four sewing stations, and the first binding appears to have been a link-stitch at two independent pairs of sewing stations. Parchment stays are present in the central folds of several of the quires. A second binding by stabbing is suggested by the presence of a set of holes on either side of the central fold of the bifolia at a slight distance from the central fold. This second binding pierced through the sides of the parchment stays and must have made the codex somewhat difficult to open. Remarques généralesParatextual features: End titles are present throughout, sometimes accompanied by short colophons. Corrections are present throughout. The codex contains three distinct sets of page numbers. Folios 1r – 34r are numbered consecutively. Folio 34v, the title page of Melito’s sermon (P.Bodmer 13) is not numbered. A new numbering sequence begins with 1 on the first page of Melito’s homily, and runs through the end of P.Bodmer 12. 1-2 Peter begins again with 1. P.Bodmer 8 contains marginal glosses. The scribal features of P.Bodmer 7 and P.Bodmer 8 are discussed in detail by Royse (see Royse, Scribal Habits, 545-614). Decorations: The end titles show various forms of decorations, the most elaborate of which are the end title of P.Bodmer 5 ( folio 25 recto), which is underscored with diples, and the end titles of P.Bodmer 8, which are flanked by coronides. RésuméPapyrus codex containing the Nativity of Mary (“Protevangelium of James,” P.Bodmer 5), the Correspondence of Paul and the Corinthians (“3 Corinthians,” P.Bodmer 10), the 11th Ode of Solomon (P.Bodmer 11), Jude (P.Bodmer 7), the paschal sermon of Melito (P.Bodmer 13), a hymn (P.Bodmer 12), and 1-2 Peter (P.Bodmer 8). P.Bodmer 5: Testuz, Michel. Papyrus Bodmer V: Nativité de Marie. Cologny-Geneva: Bibliotheca Bodmeriana, 1958. P.Bodmer 10, 11, and 12: Testuz, Michel. Papyrus Bodmer X-XII: X: Correspondance apocryphe des Corinthiens et de l’apôtre Paul, XI: Onzième Ode de Salomon, XII: Fragment d’un Hymne liturgique. Cologny-Geneva: Bibliotheca Bodmeriana, 1959. P.Bodmer 13: Testuz, Michel. Papyrus Bodmer XIII: Méliton de Sardes, Homélie sur la Pâque. Cologny-Geneva: Bibliotheca Bodmeriana, 1960. 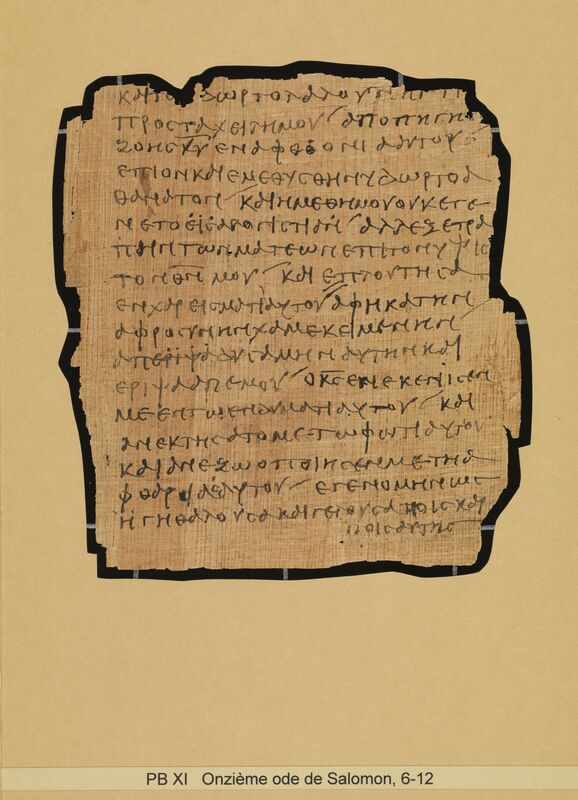 Nongbri, Brent and Stuart G. Hall, “Melito Peri Pascha 1-5 as Recovered from a ‘Lost’ Leaf of Papyrus Bodmer XIII.” Journal of Theological Studies 68 (2017): 576-592. P.Bodmer 7 and 8: Testuz, Michel. Papyrus Bodmer VII-IX: VII: L’Epître de Jude, VIII: Les deux Epîtres de Pierre, IX: Les Psaumes 33 et 34. Cologny-Geneva: Bibliotheca Bodmeriana, 1959. Nongbri, Brent. “Recent Progress in Understanding the Construction of the Bodmer ‘Miscellaneous’ or ‘Composite’ Codex.” Adamantius 21 (2015): 171-172. Nongbri, Brent. “The Construction of P.Bodmer VIII and the Bodmer ‘Composite’ or ‘Miscellaneous’ Codex.” Novum Testamentum 58 (2016): 394-410. Royse, James R. Scribal Habits in Early Greek New Testament Papyri. Leiden: Brill, 2008. Turner, Eric G. The Typology of the Early Codex. Philadelphia: University of Pennsylvania Press, 1977.